One great way of learning about Select Comfort beds is to read a Sleep Number bed review. Some consumers love them, and others question whether they are worth the high price tag! A little research will definitely help you in your final decision whether to purchase one or not. 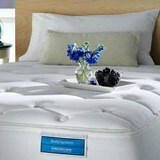 The following information will attempt to summarize what consumers think about Sleep Number beds. The intended beauty of this style of bed is that you and your partner can adjust your individual sides of the bed to your personal liking. While the concept is nice, some consumers feel the functionality of these beds compromises other, more important, aspects that a bed should offer. There were also a number of conflicting reviews. Some consumers report an alleviation of body pain while others report either no alleviation or an increase in pain. Some consumers reported on-going issues with the pump while others claimed no pump issues at all, and some seem to be in a disagreement as to whether the pump is loud or quiet. The complaints of unevenness come mostly from those who share their bed with a partner. Partners who had significantly different levels of comfort had significant differences in settings. The result of this pairing seems to cause unevenness at the center of the bed, where the two air chambers rest against each other. Other complaints resulting from this situation include difficulty with intimate activities, and sloping toward the middle of the bed causing the person to roll toward the middle. Loss of air, and fluctuation in setting, are other issues that owners of these beds reported. A little over ten percent of consumers reported their Sleep Number beds lost air; sometimes slowly and sometimes quickly. It also appears that the fluctuation issue is affected by varying conditions such as room temperature, atmospheric conditions, and the amount of weight put on the mattress. With regard to the issue of pain, the cheaper Sleep Number bed models seem to cause more pain, or at the very least, don't alleviate existing pain for some people. More expensive Sleep Number bed models have more padding which could possible account for why there were fewer complaints about pain issues. On a more costly note, one Sleep Number bed owner reported that when his pump failed, he tried to purchase a small part for the pump that would fix it, but was told that wasn't possible. He was told his only option was to purchase a new pump for $100.00. Other complaints included, out gassing which aggravated allergies, much too expensive for what you ultimately get, and terrible customer service. One consumer reported she especially liked sleeping in her Sleep Number bed while she was pregnant. She was able to adjust the bed as much as she needed to during her pregnancy in order to find a good level of comfort. She was able to easily readjust her Sleep Number bed back to the original setting after giving birth. One owner reported that he'd had no issues with the pump for his Sleep Number bed after 12 years of use. This is a complete contrast to other complaints of immediate and ongoing issue with these pumps. It's possible there were defects in the manufacturing of the Sleep Number bed pumps which would explain the conflicting reviews. Owners of the Sleep Number bed seem to be divided as far as the pain relief, or lack thereof, they experienced with their Sleep Number beds. It's hard to tell why there are such mixed reviews on this topic, but the scales did appear to tip more toward the complaint side rather than the compliment side. Every person has a different level of comfort so this may play a major factor in the mixed reviews. It's worth noting that there were really no reported complaints with regards to people having chemical sensitivity in relation to using a Sleep Number bed. After some extensive research, it would appear as if it is a lot easier to find a bad Sleep Number bed review than it is to find a good one. It's definitely worth investing the time to find out all you can before purchasing this style bed.